Palmer Hamilton Circular Booths offer a fully customizable seating area for your facility. Showcase your school’s individuality as these booths are completely unique to your facility; you can even add customized graphics or your school’s logo to increase school pride! You have the choice between fiberglass or upholstered circular booths, and these configurations are available in half and three-quarter circles. You can even mix and match different table shapes to find the perfect look for your cafeteria’s décor. Call our factory at 262-723-8200, ext. 240 for further information. 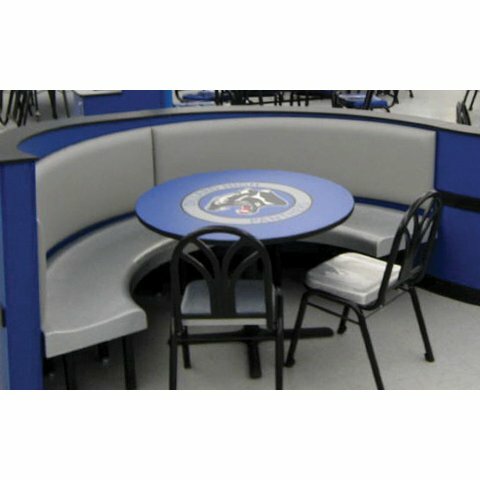 In addition to bringing a restaurant-style environment to your school, these circular booths help create an intimate setting for any group, enticing students to stay for lunch with their friends and use your Food Service Program. Fully Customizable: Available in .5″ and .75″ circular configurations, you will find the perfect combination to fit your eating area. Completely unique to your facility. Reinforced Construction: Booths are constructed of hardwood plywood reinforced with hardwood blocking. Stronger, more durable booths. Optional Laminated Box Bases with metal corner guards are available. Provides protection for knees and feet. Fire Retardant: All fabric and foam meets or exceeds California Fire Retardant Standards (CA-117). Safety is a top priority. Custom-order Fabric: Thousands of options are available to match your Food Court Décor! Coordinate with your theme to achieve the desired effect. Customized Graphic Design is available on all booth tabletops. Promote school pride! 5-Year Warranty: As part of Palmer Hamilton’s on-going commitment to quality, we warrant that our circular booths will be free from defects in original material and workmanship for a period of five years from the original shipment date. Our guarantee!